There are many things that make bearing the cold of winter worth it to me. Shop windows with their holiday displays, pulling my favorite sweaters from their summer storage boxes, the view from my window after freshly fallen snow, and Vacherin Mont d’Or. This wonderful little Swiss cheese, made only around the Jura mountains and foothills in the Canton of Vaud, can melt the frost of even the harshest winter. If you’ve never experienced this little marvel, allow me to explain. Vacherin Mont d’Or comes self-contained in its very own small pine box. It has a soft supple rind that ranges from yellow, to grey, to pale orange that when peeled back revels the most delectable fondue pot one has ever seen. It literally spoons out of the container and begs to be eaten with good bread. (However, if you’re as dedicated to cheese as I am, its even better from spoon to mouth!) Avoid purchase if the cheese looks tired and sunken in its case or is vividly orange. Vacherin Mont d’Or, at its best, is proud, puffed up, and alive. It’s rind looks soft and raised, like a wave, ready to break open from the swelling of wealth below. But what makes this cheese so special is its seasonality. The production of Vacherin had originally developed because of limited milk availability from the cold Swiss winter. Though now production is limited only on behalf of tradition, Vacherin-seekers will only be satiated from late September through April. Just as wonderful as that ice-cold bite of watermelon is in summer, ripe with sunlight and embodying its season, so is it for Vacherin and me. If I could eat it in summer, I wouldn’t. I’m sure someone other in the city must be offering this rare and wonderful cheese but, Murrays’ Cheese Shop is the only place I have seen it available on the retail market – and they deliver! For a Vacherin-filled night out, try Dovetail on West 77th. This cheese has been spotted on their cart lately. 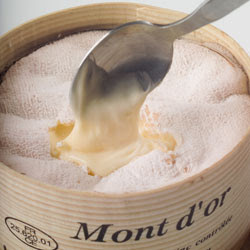 So if you find yourself in the chilly weeks to follow with the snow piling up around you, may I suggest inviting good friends over, opening that bottle you’ve been saving, and diving into a pot of Vacherin Mont d’Or. Awesome and informative first post. I have been looking forward to seeing it since earlier this week when you mentioned adding cheeses to the blog! Cannot wait for the next post! I love your writing, please tell us more about cheese. I was served Mont d'or on a barge trip in France last year and have been searching for it ever since. Now I know why it is so difficult to find...it is a seasonal cheese. Can't believe I was lucky enough to read your interesting article. Thank you! Sounds and looks wonderful. Something a cheese lover like myself will definitely have to look into. I just love that little pine box - what a great presentation. I will be looking for it while there is still time. Thanks for sharing your cheese with us.